Reglassing is the process by which older or damaged glass-lined steel equipment is refurbished to like-new condition. 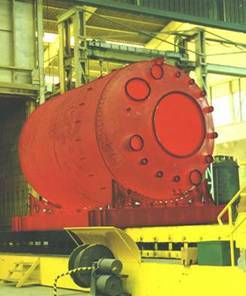 All glass-lined reactors, tanks, columns, and accessories such as covers, agitators and baffles, can be reglassed if the steel substrate is in good or repairable condition. The process starts once a vessel has been inspected and approved as a candidate for reglass. Next, the old glass lining is removed by grit blasting. After any steel repairs and modifications are complete, DDPS proceeds with the glassing process. Here we fuse corrosion resistant 3009 glass onto the prepared steel in our computer controlled electric furnaces. Finally external protective coatings are applied via DDPS' epoxy system. The end product is a high quality, glass-lined steel vessel or accessory. What are the benefits of reglassing? Reglassing is ideal for situations when time and cost are a primary issue. The turnaround time is within weeks versus months to fabricate a new vessel and there is nearly a 50% cost savings compared to buying a new vessel. Additionally, upgrades such as OptiMix baffles, extra nozzles and insulation rings can be added. All vessels reglassed by DDPS come with the same standard warranty as new vessels, ensuring you are receiving a vessel "as good as new". 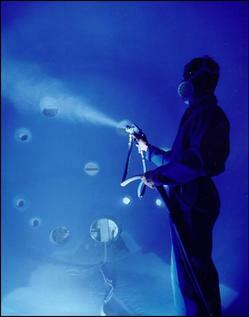 DDPS also offers reglassing on competitors' equipment. All reglassing done by DDPS is performed in the USA, in accordance to the ASME and NBIC code, at our state-of-the-art glassing facility in Corpus Christi, Texas.